We have to take advantage of all of our energy resources -- including coal -- if we are going to make it through the next 40 to 50 years. 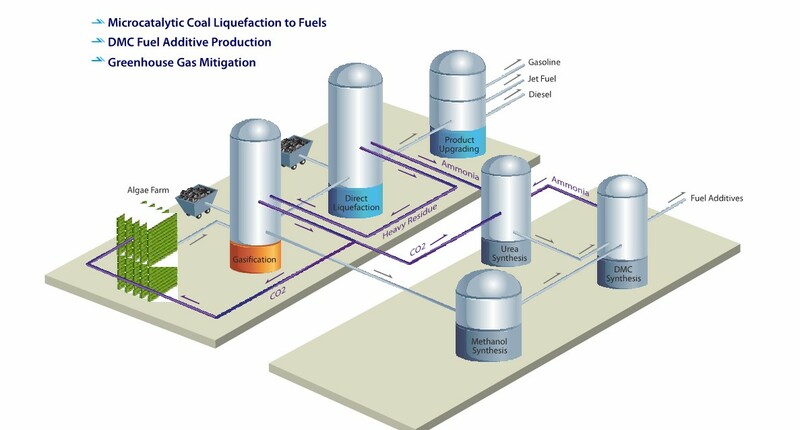 Accelergy is planning a pilot project to produce liquid fuels from a combination of coal and biomass. The process will be similar to modern petroleum refining in complexity and intensity. How does it work? Like biomass and coal co-firing for power, the introduction of biomass is the leverage used to ratchet down the emissions associated with coal-based fuels. In Accelergy’s world, the biomass of choice is camellia, and the company announced development back in March of a partnership to develop camelina resources. The more camelina in the mix, the lower the emissions. Pure camellia, there would be concerns on cost and availability in the near-term. But, aiming squarely at the 20 percent target, the company believes it can beat petroleum-based aviation fuels on cost. ... It’s commercially viable at north of 4000 barrels per day, around 60 Mgy, according to Vail. The company’s fuels are expected to be certified by 2011 – that’s work taking place at the Wright Patterson AFB in Ohio at the moment. One thing the Air Force is looking for is higher fuel densities that are highly beneficial for supersonic jets. 18 month targets for the company’s development? CBTL technology shares many process steps with crude oil refining. Both start with a basic raw material (crude oil/coal/biomass), with the first step transforming raw materials into feedstock for further processing. Oil refining utilizes an aggressive high pressure and catalytic processes called hydrocracking or coking to achieve the first step, whereas CBTL utilizes a gasification process. The second stage involves converting the feedstock into fuels. While oil refining employs a fluid catalytic cracking process for that purpose, CBTL utilizes an indirect or direct liquefaction process. Both require thermal and catalytic reactions to achieved desired results. The Accelergy process appears to be quite scalable. The company is willing to build in the US, but of course if the faux environmentalists in Washington DC restrict energy production too much, they will force an abandonment of the US for foreign shores -- just like Obama Pelosi is driving oil drilling rigs out of the Gulf of Mexico to fairer shores.